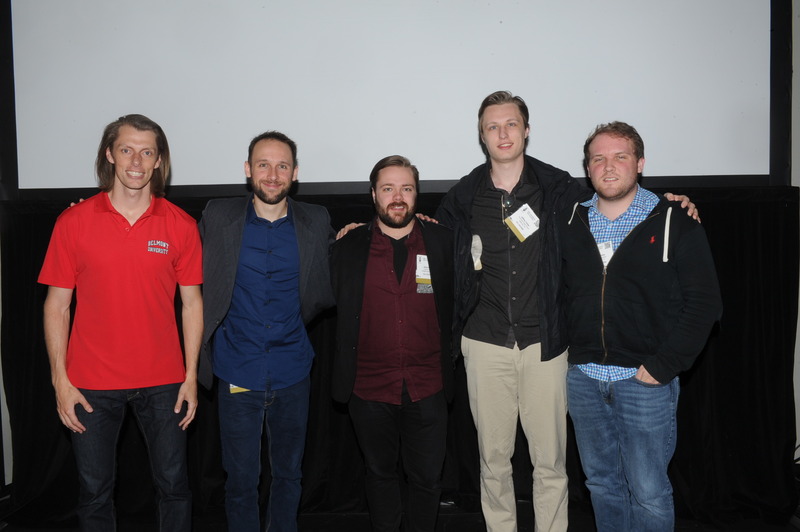 Belmont students, alumni and faculty participated in the 139th International Audio Engineering Society Convention held in New York City’s Javits Center Oct. 29 – Nov. 1. Senior audio engineering technology majors Ross Collier, Jessie Brock and Nick Lobel submitted their recent recordings in two categories, traditional studio and modern studio, in the AES Student Recording Competition. Judges for this event include respected recording engineers, mastering engineers and educators. Alumnus and recent gold prize winner in the traditional studio category Cory Wilhite also attended. Brock and Lobel received the silver award in modern studio recording and received recording-related prizes from the sponsors. Lobel presented research conducted with students Wilhite, Jeremy Deardorff and Jack Mocherman under the direction of Bulla and Assistant Professor of Audio Engineering Technology Dr.Eric Tarr with the help of Michael Janas. Their study investigated whether listeners could discriminate between real-time (RT) and double-speed (DS) digital transfers from analog tape recordings. Signals were recorded to tape at 15 inches per second (ips), then digitized at two copy rates: 15 ips (RT) and 30 ips (DS). The DS transfers were digitally time-stretched and spectrally processed to match the duration and frequency response of the RT transfers. 31 listeners participated in an experiment to discriminate between the RT and DS transfers. Results show discrimination between RT and DS transfers was not statistically significant. Additionally, discrimination did not vary significantly across source signals. AET Instructor Jim Kaiser organized and moderated two Nashville production-focused workshops. The first, “Sound of ABC’s Nashville,” featured guest presenters from the show’s audio technical team. 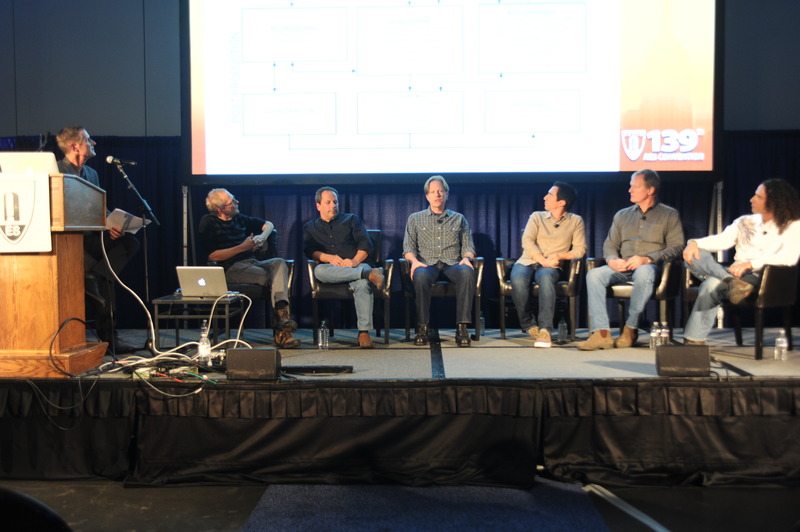 Matt Andrews (production sound mixer), Mike Poole (music mixer), Fred Paragano (dialog editor), Michael Colomby (sound re-recording mixer), Rich Weingart (sound re-recording mixer) and Glen Trew (production sound mixer) engaged the audience in an explanation of the audio production process involved in the television series and played segments of unique ‘live music performance-based’ shows. Kaiser’s second workshop focused on the music production for Kacey Musgraves’s ‘Same Trailer Different Park’. This session featured the technical story behind this critically-acclaimed break-out record, from the selection of Nashville’s historic RCA A (Grand Victor) Studio for the initial tracks to final mastering by Andrew Mendelson at his Georgetown Masters facility. The audience was treated to an in-depth look at Musgraves’s hit singles (“Merry Go Round” & “Follow Your Arrow”) that defined this seminal recording. Kaiser also chaired and participated in convention meetings of the Convention Policy Committee, Technical Committee on Recording Technology & Practices, Education Committee and the Board of Governors.